Using the right makeup products is important. However, using your makeup tools the right way is also important. That’s why in this article, I will share my best tips on how to use a makeup sponge. Plus, I will share types of makeup sponges and how to pick the best one for you, how to apply concealer with your sponge and how to use it to contour. Take makeup sponges seriously. It depends on your makeup sponge how long it will last. What are the benefits of different beauty sponges? With the evolution of makeup products, different makeup sponges were created. And as I said, it’s important to have the right tool to apply your makeup perfectly. It’s not just the quality of your foundation, concealer and contour makeup that counts, but the quality of your makeup sponge as well. There’s a lot of makeup sponges on the market. However, these are the most common types. Choose the one that matches your needs. This type of sponges looks like someone cut a slice out of an ordinary teardrop sponge. And while the tapered end is perfect for detailing and blending, the flat side is ideal for contouring, especially with creamy products. The wide rounded side of the flat end makeup sponge is perfect for foundation and bronzer application. So, if you’re a person who invests time into smoothening skin complexion, this is the perfect match for you. The name of this makeup sponge speaks for its shape. It has the shape of a disc and it usually comes with your compact. It’s perfect for pressed powder application, however, keep in mind, that it steals a lot of product. According to makeup experts, it’s best to wash it if it collects too much product. Perfect sponge for pressed powder addicts. As the name says, this type of makeup sponges looks like someone turned your tears into sponges. It’s perfect for blending, contouring and highlighting. I’ve been watching many makeup videos, and almost every beauty guru uses these makeup sponges for both creamy and liquid products. However, don’t feel pressured to pick this type. Everyone’s taste is different. Every skin complexion is different. Pick the one that suits you best. As you can assume this makeup sponge appears like a pear. It’s perfect for people who want to feel in control and want to cover specific areas. Plus, it gives a flawless finish. This type of sponges looks like something that children play with. But don’t mistake the weird shape for a dysfunctional sponge. Triangle makeup sponges are just perfect for hard-to-reach areas. Plus, they don’t absorb much product. Triangle makeup sponge can assist you when applying your favorite foundation, concealer, and illuminators. Now that you know the basic types of makeup sponges, let’s take a look at the benefits of each. I’ve touched on the purpose/benefits of beauty sponges when I listed the basic types, but I wanted to provide a detailed description and add a few more sponges on the list. This type of sponge is best for creamy and liquid products, but concealers as well. The benefits of using this sponge are the perfect contouring, highlighting and blending. It’s also great for applying products under the eyes, such as concealers. Plus, you’re getting an airbrush-like polish. It’s ideal for people who don’t want to feel like wearing a mask. I’ve mentioned the disk beauty sponge. And I’ve also mentioned it’s perfect for pressed and loose powders. However, what I haven’t mentioned is that it will take you less time to apply your powder with it. Plus, it’s good for a quick covering of large areas. Made of cotton fibers, the disk beauty sponge is just perfect for people with sensitive skin. Cosmetic wedges are something similar to the triangle makeup sponge. They look like toys. However, they’re perfect for applying concealer and covering dark circles and applying liquid foundation and illumination. Benefits of using cosmetic wedges are that they don’t absorb the product and reach the smaller areas of your face more easily. The cellulose cleansing sponge has nothing to do with applying makeup but taking it off. The benefits of using this type of sponge are fast removal of face masks and makeup, both sides for usage, mild exfoliation and cleansing pores. Plus, it’s perfect for people with sensitive skin. However, if you want your cleansing sponge to last longer, you have to wash it after every usage. Immediately replace it if it smells odd or loses the shape. Extra tip: Dampen your cleansing sponge before using it. Just hold it under the water and wait for it to expand. Squeeze out the water and you’re ready to clean your face. Concealer has become one of the most popular makeup products that everyone adores. However, to feel the magic it provides for your makeup look, you have to apply it right. If it’s your first time applying concealer with a sponge, don’t worry. I have your back. Just follow these simple steps and you’ll do just fine. Now, let’s get the party started. If you want to get the best results, it’s smart to use a damp sponge as most beauty gurus do. Just hold the sponge under the water and wait for it to expand. Squeeze out the water and start applying your makeup with a functional and bouncy wet sponge. When applying concealer under your eyes, it’s smart to use your fingers because it’s a more sensitive area that’s harder to reach. Use your right finger if you’re right-handed and your left finger if you’re left-handed. This will help you blend the concealer nicely. You don’t have to continue with a highlighting concealer but I suggest you do it. Apply a highlighting concealer in a liquid form under the eyes to light up the area. Apply to the rest of your face with gentle tapping. However, keep in mind that this step is optional. If you have scars, spots or blemishes, don’t worry because a few moves with a pointed concealer brush will wipe everything away. If necessary, use fingers to blend it better. Spritz your makeup sponge with setting spray while it is still damp. This technique will help you blend everything better. It will extend the life of the concealer on your face. When you’re done applying concealer all over your face, take your damp makeup sponge and start blending. Blent it into your skin using soft and gentle moves. Start with your under eye region. Use the tapered or pointed side of your sponge for this purpose. It’ll provide the natural, smooth and flawless finish that everyone’s trying hard to achieve. The final step is to set up the concealer with your beauty blender. You could either use a translucent loose powder. Or a pressed powder. It all depends on your taste and need. No matter what powder you choose, take the flat side of the makeup blender and press it against the product. Apply over your face and once you’re done, take the rounded end to even out the skin complexion and make sure that you blended everything perfectly. You can also use your makeup sponge for contouring. If you’re obsessed with using it for concealing and coverage, you will also become obsessed with contouring and using it for highlighter too. However, if you don’t know how to contour with a sponge, read on. As you can assume, contouring is one of the hardest parts of doing your makeup. But it’s not impossible to learn how to do it with a beauty sponge. First, make sure you have the right size. I suggest that you use the smallest sponge you can find for the best results. First, apply your contour makeup. 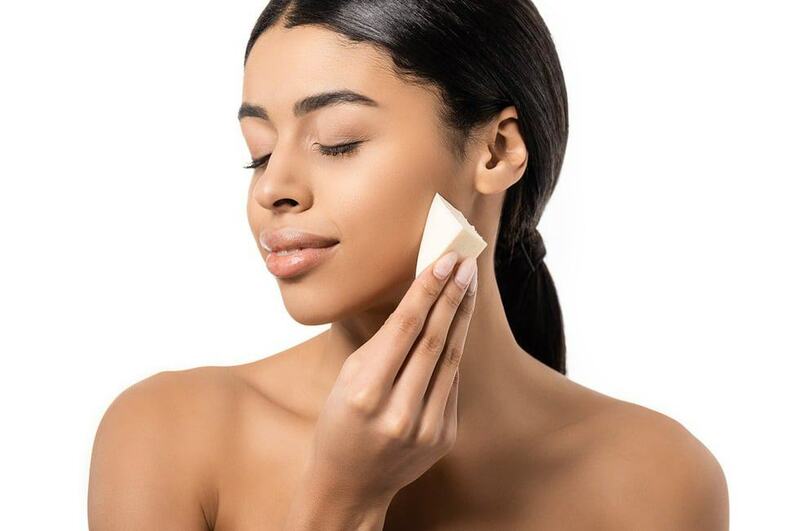 Use the tiny sponge to buff in or blend the contour on your forehead, nose, cheeks, jawline, and neck. If you applied too much product, use a clean sponge to remove it. However, make sure you don’t press too hard on the face. It might move and ruin your foundation. This will help you contour your face and you will never feel the heavy contour on your face ever again. The secret is perfect blending. If you want to extend the life of your makeup sponge, you have to maintain it, just like any other reusable makeup tool. Plus, if you clean it on a regular basis, you will prevent skin irritations caused by bacteria that can build up on your makeup sponge if not clean. In order to prevent this from happening, I suggest that you clean your makeup sponge at least once a week. How to clean your makeup sponge? Just follow these simple steps. In order to clean your makeup sponge the right way, it has to be wet. Use warm water to dampen your sponge. After seconds, squeeze the water and move onto the next step. You can use dish soap, baby shampoo or solid soap to clean your sponge properly. If you use liquid soap, make sure it absorbs well into the sponge with massaging the sponge with your fingers. Wash lightly until the soap is out and your sponge looks clear. However, if you use a solid soap, make sure it’s unscented. Put the soap under water and get it wet. Rub it between your hands before you massage it into your sponge. Rinse and repeat the process until your sponge looks clean and clear. After, take a towel and wrap your sponge in it. Leave it to dry and make sure it’s completely dry next time you use it. Don’t get surprised if you notice that some makeup sponges come with their own soaps and liquid soaps for cleansing. It’s nice to have a special product for cleansing, however, it’s not a big deal if you don’t and applies my tricks. You will get the same exact results. If you decided to try the flat makeup sponge from the list and it’s your first time using a flat makeup sponge, don’t worry. I have you covered for this one too. Follow these two simple steps I did the first time I used a flat sponge and you will do just fine. No matter what you’re using the flat makeup sponge for, make sure it’s wet before you do it. If you use it for a foundation, spritz a small amount of the product on hand and dip the sponge into the foundation. If it’s not wet, it will soak up the product. If not, it will help you apply it perfectly. Start with the middle of your face and apply it outward. Just press the wet makeup sponge onto the powder and apply it over your foundation. This will keep your foundation in place and provide a more natural, long-lasting finish. Well, there you go, guys. I hope you enjoyed this article. I also hope you find it helpful. With so many types of makeup sponges on the market, it’s hard to find the perfect one. However, I really hope that my detailed explanation on each type makes it easier for you to pick one. Share this article with someone you love and see you at the next one.